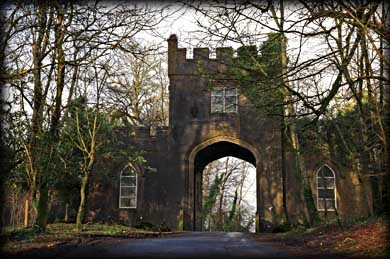 Once the fortified outpost of the Irish McDonagh Clan guarding the ford across the river Unsin, the original 14th castle and surrounding lands were allotted to Edward Cooper by Cromwell when his army defeated the O'Brien Clan in 1663, killing O'Brien in the battle. 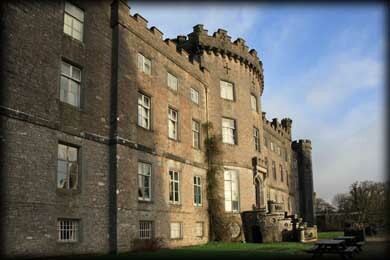 The castle is still owned by 10th generation descendents of a son of O'Brien who took the Cooper surname as protection from English invaders after his mother married Cooper, and is now a castle hotel. 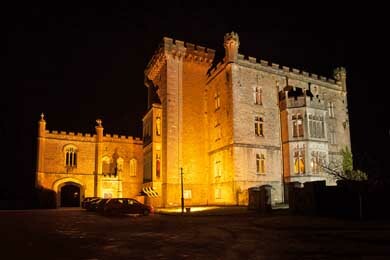 We treated ourselves to two nights stay in this castle just after Christmas. The castle we see today was built in 1802 over the raised basement stone of the former Cooper family mansion known as "Mercury", and contains parts of the earlier houses. It was again enlarged and remodeled c 1870 with the addition of Gothic Revival porte-cochere, a battlemented and machicolated square tower, and chapel to the north front; and a two-storey canted bay window to the west front. A central crenellated projecting bow and ornamental doorway leading to the garden front (south) was added in 1896. The castle is an impressive monumental structure with the main roof hidden from view behind a battlemented parapet wall, dressed limestone diagonally-set, corbelled chimney stacks, cast-iron down pipes, and octagonal turrets. 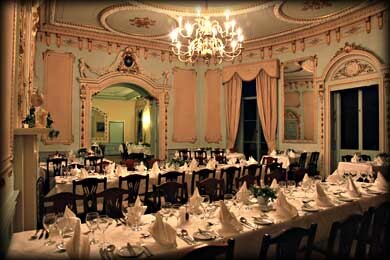 We were delighted by the old world charm and relaxed elegance of the fine Irish Victorian and Georgian interior architecture. From the beautifully decorated entry staircase leading from the portico up to the hallway, the tree-lit hallway with large logs burning in the fireplace, large carved wood staircase up to the guest rooms with a huge stained glass window that traces the Cooper family tree on the landing, dazzling dining room decorated in Louis Philippe-style plasterwork, and sitting rooms flanked with equally welcoming lit fireplaces, the experience of this castle will be treasured. We approached the castle through a large gatehouse then drove through pastureland on a road that could use a bit of maintenance and past a large earthen ringfort before the castle appeared before us. 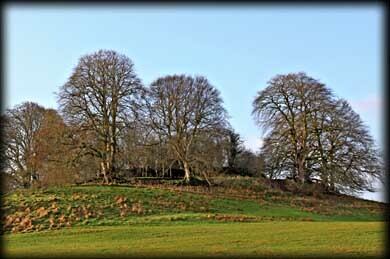 As we had planned to visit a few other sites in Sligo we did not have time to explore this wonderful looking ringfort. As you can see from the image below the ringfort looks very promising. Following hard times after the Second World War the castle stood empty and derelict until 1989 when it was transformed into the country house hotel with just a few modifications to the interior. The retention of all the grandiose features of a time long past without mass-appeal modernization (or much heat) made our experience of this castle truly memorable. Situated: Take the N4 north to Collooney. Turn right on to the R200. The entrance to the castle is about 500 metres down here on your right. Discovery Map 25: G 6971 2514. Last visit Dec 2011.